Beef Stroganoff is such an easy meal and yet it's flavorful and comforting. Loaded with tender slices of beef, onions and mushrooms, it's a Russian comfort food that's won over the culinary world. Here are my secrets for making the best Stroganoff. Beef Stroganoff is such an easy meal and yet it’s flavorful and comforting. 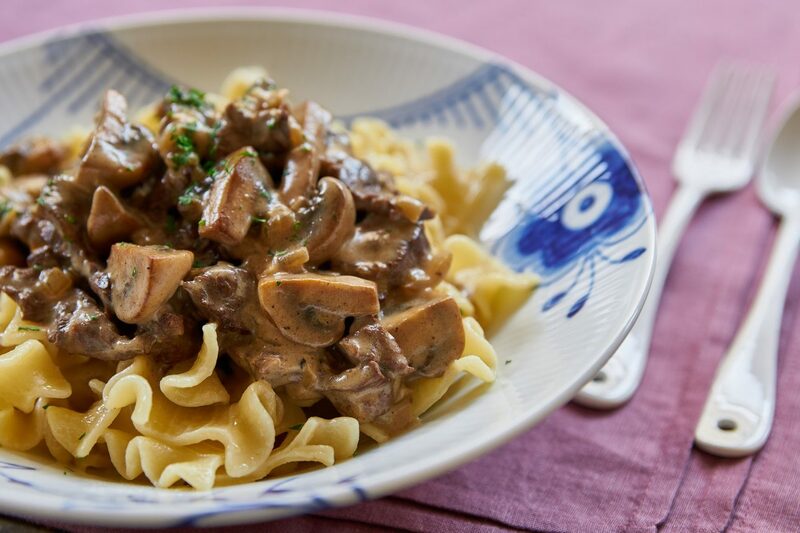 My secrets for making the best Stroganoff. Growing up, my mom was undeniably the queen of the kitchen. Although my step-dad owned Thanksgiving, I can count the number of times he cooked dinner each year, on one hand. On the rare occasions he did cook, Beef Stroganoff was a perennial favorite, and something I crave to this day. It wasn’t fancy but something about the way the intensely savory flavors of the mushrooms, onions and beef melded with the rich and slightly tangy sour cream made it irresistibly appealing. Sometime during college I was horrified to learn that “real” Stroganoff includes tomato. I summarily pushed the Americanized childhood favorite to the back of my mind and spent the next 20 years of my life cooking stroganoff with tomatoes. The thing is, every time I’d make it, something just didn’t taste right. Don’t get me wrong, my Chicken Stroganoff made with tomatoes is very good, but no matter how many times I make it, it’s not quite what my tastebuds expect when I’m in the mood for Stroganoff. 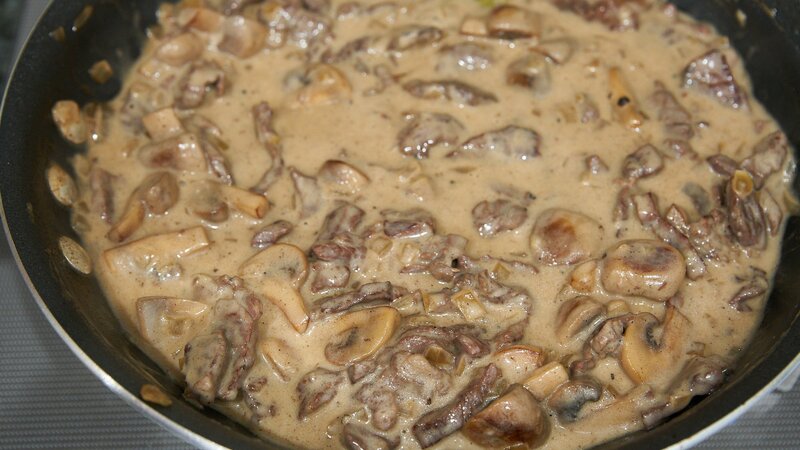 Recipe for making the best Beef Stroganoff. Thus, my unapologetically American version of Beef Stroganoff. It’s not going to win any awards on authenticity or looks, but if you set aside any preconceptions and judge it purely on taste, it can’t be beat. In terms of ingredients, this is a super simple dish, so how it turns out, depends largely on your technique. Here are a few tips to get you headed in the right direction. 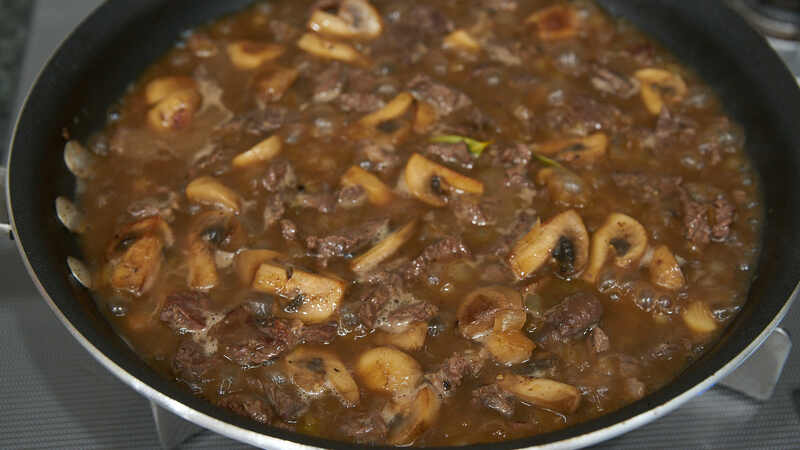 The first thing is to take full advantage of the Maillard effect and throughly brown the surface of the beef and mushrooms in a hot pan. While Stroganoff is often made with tenderloin, I prefer making it with hanger steak, which might not be quite as tender, but is much more beefy in flavor. Look for a piece with reasonable marbling, and as little gristle as possible. Hanger steak is a cut that works better cooked from medium-well to well-done, so you have time to let the flavors of the beef meld with the sauce, but be careful not to cook it too long, or it can dry and stringy. Finally I like to avoid the time and hassle of making a roux by stirring the flour directly into the sour cream and adding it in at the end. This is a techinque I picked up while perfecting my Chicken Paprikash, and it’s brilliant in that it’s not just a shortcut, but one that produces a more consistent end result. 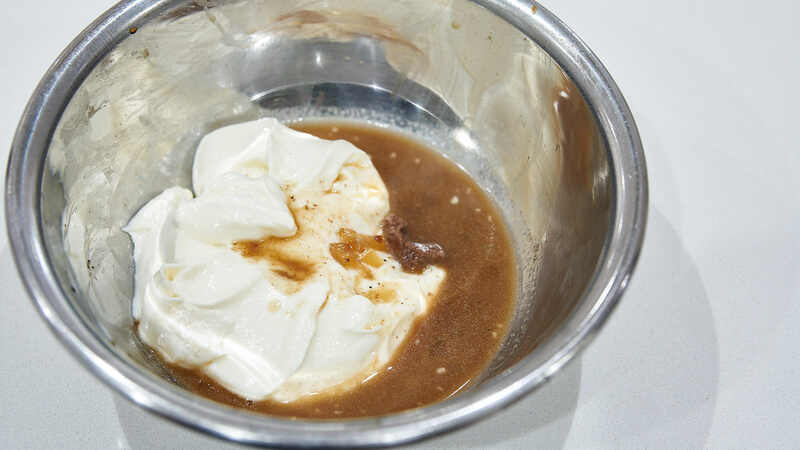 Anytime you’re adding sour cream to a sauce, you need to temper it, as it will curdle if it’s added directly to a hot liquid. This is easily done by stirring in small amounts of liquid from the pan into the sour cream until it is warm. Then you just pour it all into the pan until the Stroganoff has thickened. Season the beef with the salt and pepper. Add the oil to a pan over medium-high heat. 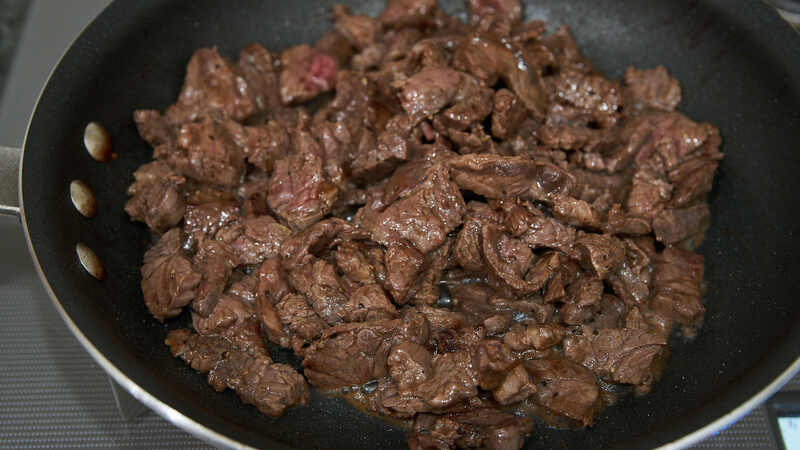 When the oil is shimmering, add the beef in an even layer and fry until browned on one side. Fry the beef until evenly browned and barely cooked through. 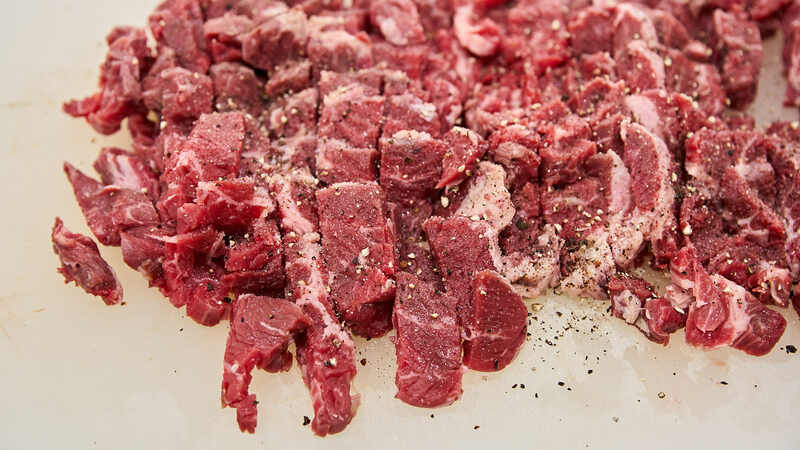 Transfer the beef to a bowl. 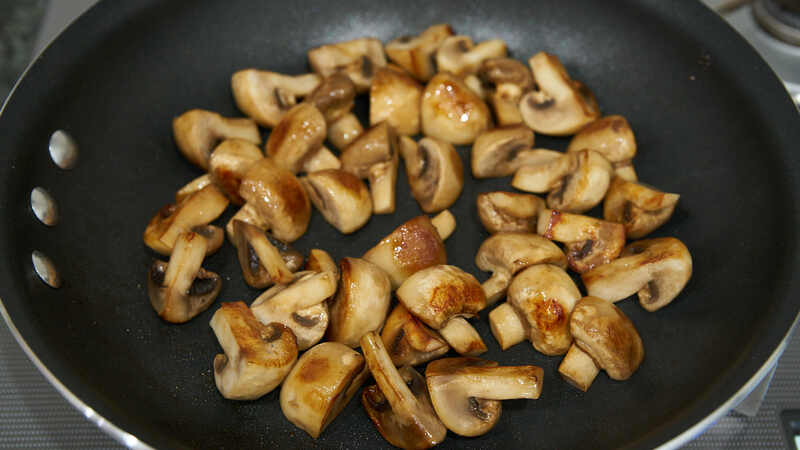 Melt the butter in the same pan and then add the mushrooms. 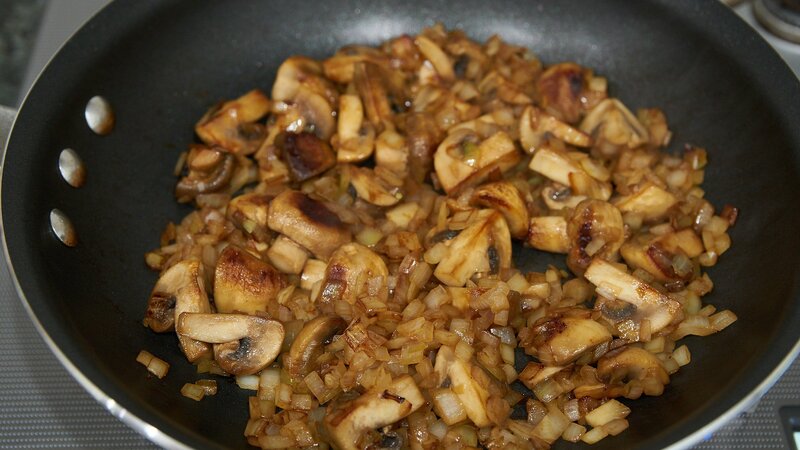 Let the mushrooms brown on one side before tossing them to brown the other side (a total of about 5 minutes). Turn down the heat to medium low and add the onions, saute, stirring or tossing regularly to ensure even browning. Add the egg noodles to the boiling water and cook according to the package directions. When the noodles are done, drain and toss with 1 tablespoon of butter or olive oil. Add the wine and scrape up any browned bits form the bottom of the pan. Turn up the heat and boil the wine until it's mostly evaporated. Add the beef stock, worcestershire sauce and bay leaf and then return the beef to the pan. Turn down the heat and simmer for about 5 minutes, until the beef is cooked through and tender. Add the sour cream and flour to the bowl that held the beef and whisk together until smooth. When the Stroganoff is cooked, use a ladle to spoon a little of the liquid into the sour cream and whisk to combine. Repeat, adding a little stock at a time until the sour cream mixture is very warm. Pour the sour cream mixture into the pan and stir to combine. The Stroganoff is done when the sauce has thickened. 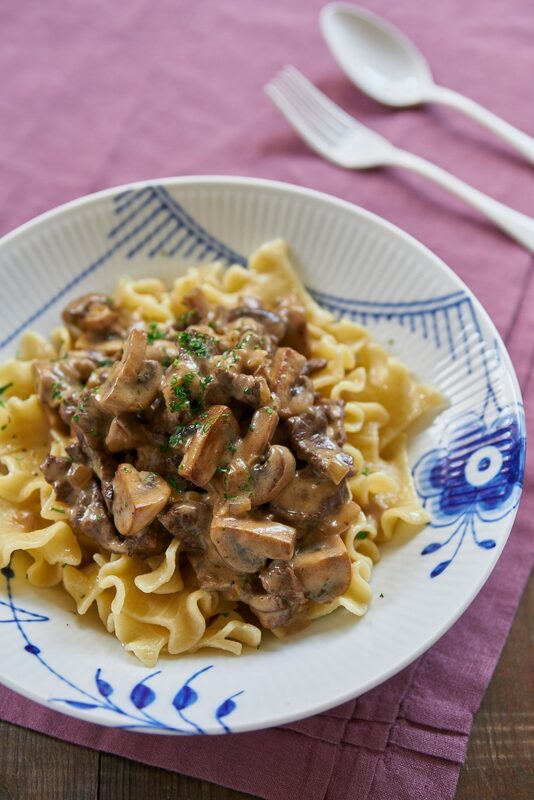 Serve the Stroganoff on a bed of buttered egg noodles. One of my favourite comfort meals. I can always rely on this one to bring a smile to my lips! Hi Nadine, thanks so much for taking the time to let me know you enjoyed this!